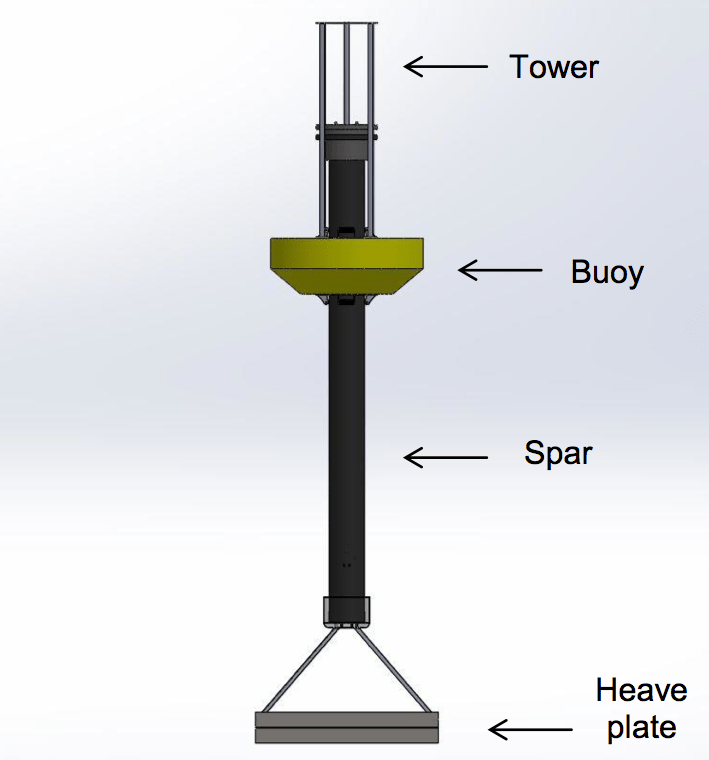 This is part three of a 10-part series chronicling the R&D of a wave energy converter. Read part one and two. Our team of five mechanical engineering students had set out to design a machine that could harness the up-and-down heaving motion of ocean waves and convert the kinetic energy into electricity. Since we were using this as our senior design project to earn credits towards graduation, we had to design and build a prototype within the 24-week timeframe of the class. 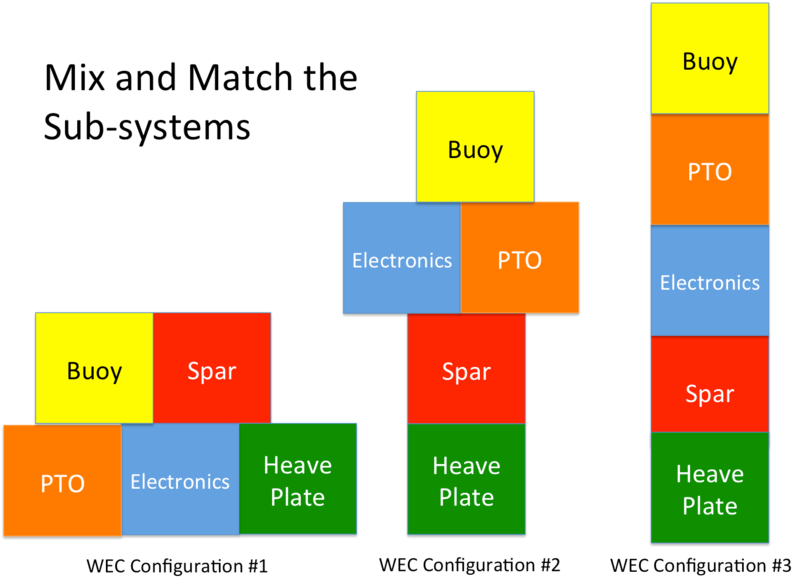 After investigative research, the team had broken down the wave energy converter (WEC) into five major subsystems: buoy, hydraulics, electronics, spar, and heave plate. 1. The system should be modular and small enough to be transported via a single passenger car or truck. This placed limits on total size and weight. 2. The system should operate in 1′ to 8′-tall ocean waves and with a maximum power output of 100W to 150W. This limited material selection and made the efficiency of the device a high priority. 3. The system should be built primarily from off-the-shelf components using methods that could be replicated by others who only have access to limited tooling/machines. This restricted potential manufacturing methods and more importantly impacted where we could source parts from, as well as the types of materials we could use. It’s easy to see that there are many ways to arrange five subsystems into a configuration that might generating electricity. You can mix and match them like building blocks, but it was our duty to try and build a machine that would meet all the criteria listed above. By week six we hit a serious roadblock. Stalled and running out time, we abandoned the notion of trying to solve every single unknown all at once. Instead we began to make small assumptions that would advance the design process, even if we knew we lacked key pieces of information at the time. At first this method seemed goofy and unscientific, but as long as we kept track of all the assumptions and actively searched for better solutions, this allowed us to continue to refine the design. As an example, I needed to know the maximum volume of the buoy before deciding which two-part expanding foam to purchase; however, the design for the buoy had not yet been finalized because we still needed to know the total weight of the WEC. So I had to make a calculated approximation based on the available information that we had at the time. Later on, when those approximations turned out to be wrong, I could simply go back and revise the calculations and see what else needed to be updated. It seems trivial in hindsight, but the most important aspect of this “calculated assumption” mentality was that we were now able to tie all the pieces together analytically. Team members Alex Beckerman and Tom Rumble created computer simulations to predict the power output of the WEC for specific wave height and periods using the program MatLab. Alex and Tom worked tirelessly to improve the codes in order to obtain more realistic results, accounting for factors like friction, inertia, and later on hydrodynamic damping effects. The computer programs streamlined our efforts and enabled us to compare different configurations and designs side-by-side with the data plotted in graphs and tables. By the end of week 11 we were back on track and finished development of the WEC-002 concept right before the Preliminary Design Report had to be submitted to the professor. Results from an early computer simulation to predict power output of WEC. While Alex and Tom had been working on the Matlab codes, team member Kevin Quach and I had created a detailed 3D CAD model of the WEC-002 plans using SolidWorks From the CAD model we could determine physical parameters like total weight, locate the center of mass to solve buoyancy problems, check to see if components would fit together, and most importantly start to plan the fabrication and construction phase. The concept for WEC-002 was very similar to designs we had read about from the University of New Hampshire Wave Energy class project. 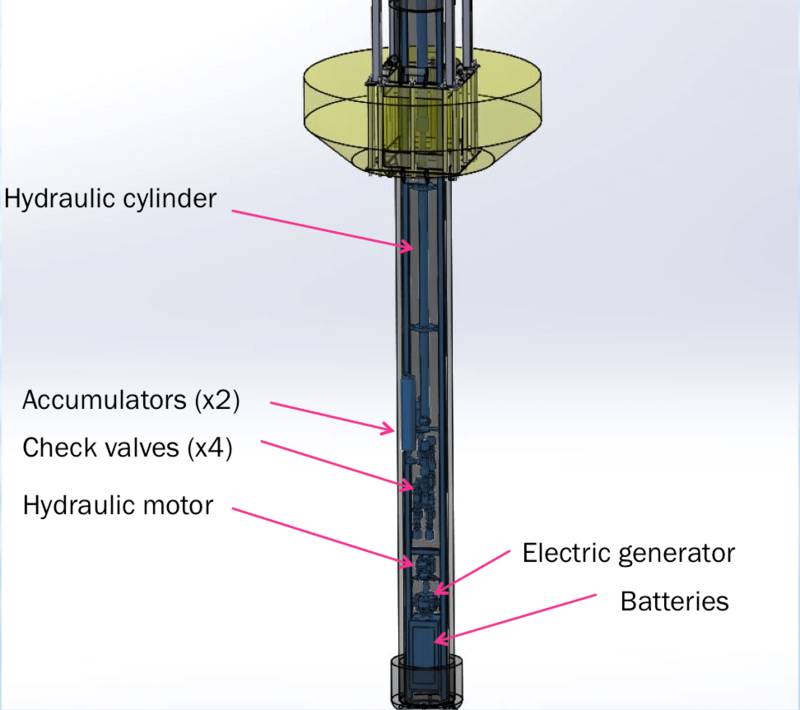 This methodical and well-organized wave energy converter project was actually the joint effort of multiple senior design projects and spanned more than three years. The 2008, 2009, and 2010 reports are a great source of information, and discuss a wide range of topics from computer modeling to physical prototyping and testing in a wave tank. As of 2010 the team was working to test their PTO (power takeoff) in a laboratory setting with a future goal to preform ocean testing at the school’s aquaculture site. In our eagerness to begin building, our team skipped some of the very important lessons that can be learned from those three reports. So, if you are interested in building a wave energy converter I HIGHLY recommend taking the time to sit down and read all three documents. Similar to the New Hampshire design, the WEC-002 used a large pipe with caps at both ends to create the spar. This spar would then slide up and down through the square hole cut in the center of the buoy. Since we planed to fabricate our own buoy, it was decided that a square hole would be easier to build using plywood. In order to produce electricity, the yellow buoy and the spar must not move together, but instead move up at different times. All the electronics and hydraulics were housed inside the large pipe, which was made from high-density polyethylene (HDPE).The major benefit of using HDPE was that endcaps could be thermally welded on to the ends, and a stainless steel plate and rubber gasket could be bolted against the top HDPE flange adapter to create a removable waterproof lid. This would allow access to the PTO, which would slide in and out of the spar for maintenance and repairs. Unlike cheap, mild steel, this HDPE pipe would not corrode in the saltwater. It was also chemically inherit, waterproof, and moderately UV-resistant. 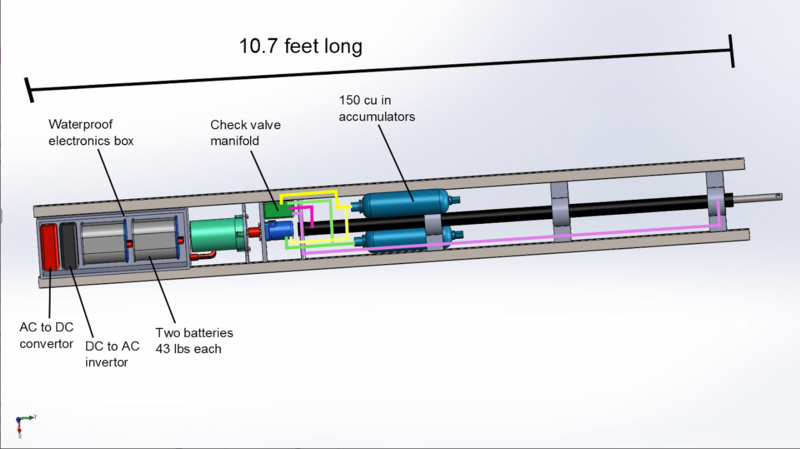 Our spar needed to have an inner diameter of at least 11″ to fit all the hydraulic equipment inside and had to be approximately 16′ long to maintain a neutral buoyancy. Normally, this type of pipe is sold in 50′ lengths, but we found a local vendor who was willing to sell us a scrap piece, only 30′ long, at a discounted price. With an outer diameter of 14″ and an inner diameter of 11.6″, the pipe weighed 22 pounds/foot and we had to purchase the entire 30′ length. Additionally, the vendor would have to thermally weld on the endcaps with a specialized machine, which meant this was definitely not a DIY option. At the bottom of the WEC was a large metal heave plate to create hydrodynamic drag that would oppose the upward heaving motion of the buoy floating in the ocean waves. The heave plate was an 8ft2 plate with 6″ walls welded around the perimeter. This was done to take advantage of the added mass effect in fluid mechanics; by capturing the volume of water directly above the plate, a larger force would be required to accelerate both the plate and water together and effectively increase the drag force of the heave plate. 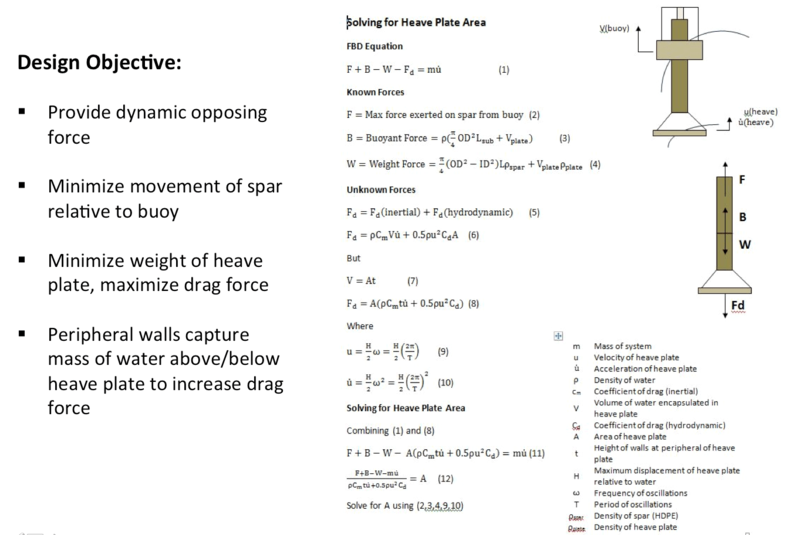 When the plate is not moving in the water, the added mass effect would be negligible so only the actual weight of the heave plate would be pulling down on the spar. But if the spar bobbed up and down, this would cause the plate to accelerate and decelerate, and suddenly it would feel as if a much larger plate was pulling on the bottom of the spar. This little feature was critical (thank you, Dr. Andrew Hamilton!) because we needed the largest possible drag force to oppose the upward heaving of the buoy while still having the spar be neutrally buoyant. 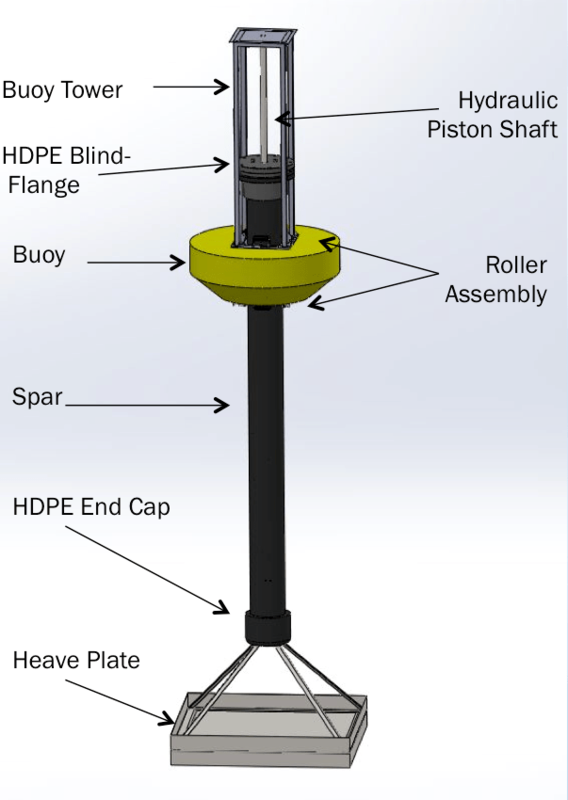 Relative movement between the buoy and spar would cause the hydraulic ram to move up and down and pump hydraulic fluid through the PTO to spin a generator and produce electricity. Without the added mass effect, we would have needed to build a 20’x20’ heave plate, which would have been too heavy and expensive to build. Instead, we would purchase 4′-wide cheap sheet steel and use angle iron to build a fame. The sheet steel would be welded to the frame and reinforced in the center with crossbeams to make a stiff and light weight plate. To maximize the added mass effect, sidewalls were also added to the bottom of the heave plate in hopes of capturing a larger volume of water that would stick to the bottom of the plate due to adhesion. To keep the buoy centered around the spar we planned to secure two sets of dock rollers to the top and bottom of the buoy. Lengths of all-thread would then be used to sandwich the buoy in-between the metal roller frames. These rollers would loosely rub against the exterior of the HDPE spar so that if a large wave crashed against the buoy the side load would be transferred to at least two of the rollers and prevent the foam from being crushed. This was a serious concern since one of the biggest variables in this project was the size of the ocean waves that the WEC would be subjected to during testing. From the NOAA wave data for Bodega Bay, Calif., we had determined that 95% of the waves should be between 1’–8′ tall (two standard deviations about the mean wave height). The hydraulic ram we had spec’d only had a six 6′ of travel, so the rubber rollers would also function as end-stops to prevent the hydraulic ram from reaching the end of its stroke. When designing the PTO we assumed an ideal operating condition with a wave height of 6′ and a wave period of 10 seconds. From these parameters we could determine the average fluid flow rates from the hydraulic piston and work our way down to the hydraulic motor. The PTO consisted of the following components: a double-acting hydraulic cylinder with a 2″ bore and 72″ stroke, an Eaton vane motor capable of rotating at 1,300–2,100rpm, two hydraulic accumulators with the larger accumulator used for the downstroke to hold the excess fluid, four check valves (one-way valves), a 1/2 horse power permanent magnet DC motor run backwards to act as our generator, and a bank of marine-grade deep-cycle batteries to collect all the energy. This was before we abandoned the idea of storing the energy using onboard batteries, but we’ll go into more details in the next post. Power-Take-off “sled” slides in and out of spar. Now that we had a design that looked good on paper, we desperately needed insight from an outside authority to help us identify any obvious faults in the design. At this point we hadn’t really touched the grant money yet, and I was apprehensive about spending all that money without having someone double check our work. What we really needed was someone who was familiar with building machines for the ocean or better yet someone who had built and tested ocean power devices. The problem was we needed to start ordering parts and materials right away if we were going to be able to finishing building this thing in the remaining 12 weeks so we had to find someone fast. In a stroke of pure luck, I reached out to the Monterey Bay Aquarium Research Institute (MBARI), having contacted them earlier after reading about their wave energy converter project, and somehow managed to get an invitation to visit the research center. Awesome! The team threw together a slideshow with all the figures from our simulations and CAD models and jumped in the car. Driving down the road to Moss Landing, I thought about all the work we had pumped into this project and I was proud of our team and what we had accomplished so far. I knew the design could be improved in some areas, and I expected that once construction started there would be minor adjustments or changes, but what I didn’t realize was that the WEC-002 design needed an entire overhaul. Tune in next week for part 4!